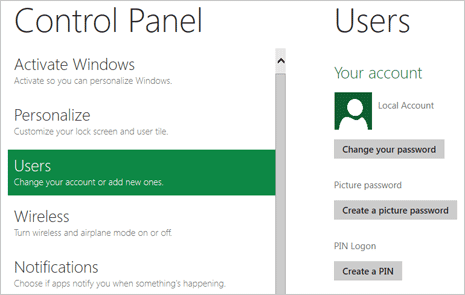 In the new Microsoft Operating System named "Windows 8" support two new ways for login using pin code and photo (picture) password methods, Now we show you, how you can Setup both new Login methods Step by Step. Step 1: On default metro style home screen, click Control Panel option. This will open Control Panel page in metro style interface (which is all white and simple style looks). Step 2: On Control Panel window, click Users (Change your account or add new ones) option. 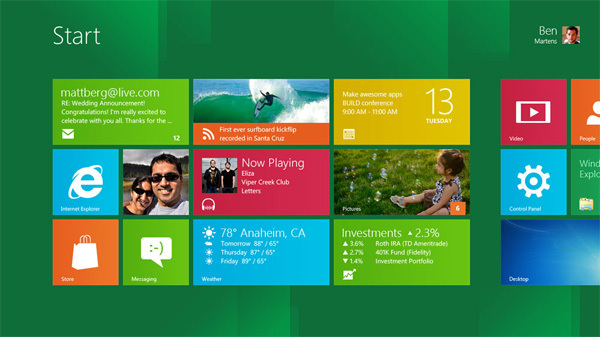 It show listing of various options for current user account for your Windows 8 computer. Step 3: To setup Photo Password login option, click ‘Create a picture password’ button. You will get prompt to enter password of your current Windows user account. Enter the password and click OK button. Picture password is set with 3 gestures: size, position and directions of gestures. Click Choose picture button to select picture of your choice. Then choose gesture you want to make to login everytime using Picture password method. On a desktop system you can use mouse for making gestures (which is kind of uncomfortable). This method of login is more suited for tablets and handheld devices which have touch screen interface. If you find this uncomfortable, then you may use other Pin code method for Windows 8 login. Step 4: To setup Pin Code login option, click ‘Create a PIN’ button under Pin Login section. Enter your current Windows user account password and then click OK button to continue. Then enter PIN number of your choice (make sure you remember it or write somewhere at secure place). Then click Finish button to complete setup of Pin Code method to login into Windows 8 computer.